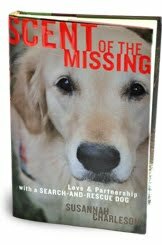 In Scent of the Missing: Love and Partnership with a Search-and-Rescue Dog, Susannah Charleson offers a personal but incredibly informative look at canine search-and-rescue. Using her own experiences as a field assistant, and later as a handler of her own dog, Charleson shares the details of what goes into training and searches, which dogs are best for this line of work, the sacrifices that volunteers make, and the balance between work and home for both dog and handler. I am not a "dog person" at all. I think some dogs are cute from afar and that's about it. Yet I really enjoyed this book. It was fascinating to hear stories about how these dogs work, the methodical way they search for a missing person. Some of the search missions were devastating to read about, especially the search for a child who was later found dead, and the search for remains after the Challenger space shuttle explosion. These stories brought tears to my eyes. Others made me laugh. The work that goes into training seems much more strenuous for the handlers than the dogs. I can't imagine making such a commitment, but am grateful that people like Charleson are willing to do so. Her search stories are mixed with stories of a homelife filled with animals. Many of her anecdotes about her animals' interactions were quite interesting and funny, especially when she introduced her new search dog, Puzzle, to the family. If you're a dog-lover, I would expect you'll love Scent of the Missing. Charleson successfully weaves informative details with personal stories to make a complete story of life on a search-and-rescue team, and the bond between handler and dog. Susannah Charleson, author of Scent of the Missing: Love & Partnership with a Search-and-Rescue Dog, works as a handler with her partner, a Golden Retriever named Puzzle, for the Metro Area Rescue K9 unit in Dallas, Texas, a volunteer canine search-and-rescue (SAR) team responding to local, state, and national search and recovery cases. She also serves as the team's public information officer and gives lectures across the country about SAR. A flight instructor who previously flew disaster searches, Susannah is also an experienced television and radio broadcaster. She and Puzzle share their home with six other dogs, four cats, and a fish named Sound Bite. For more information please visit http://www.scentofthemissing.com/ and follow the author on Facebook. This review was written based on a copy of Scent of the Missing that I received from Tor and Forge Books in exchange for an honest review. In the long light of early morning, Hunter circles what remains of a burned house, his nose low and brow furrowed. The night's thick air has begun to lift, and the German Shepherd's movement catches the emerging sun. He is a shining thing against the black of scorched brick, burned timber, and a nearby tree charred leafless. Hunter inspects the tree: half-fallen, tilting south away from where the fire was, its birds long gone. Quiet here. I can hear his footpads in the wizened grass, the occasional scrape of his nails across debris. The dog moves along the rubble in his characteristic half-crouch, intense and communicative, while his handler, Max, watches. "She's not in the house," I murmur into the radio, where a colleague and a sheriff's deputy wait for word from us. "Let's go," says Max to Hunter. And then Hunter is off, scrambling up the ridge with us behind him, crashing through the trees. We hear a surprised shout, and scuffling, and when we get to where he is, we see two men stumble away from the dog. One is yelping a little, has barked his shin on a battered dinette chair he's tripped over. The other hauls him forward by the elbow, and they disappear into the surrounding brush. A third man has more difficulty. He is elderly and not as fast. He has been lying on a bare set of box springs set flat beneath the canopy of trees, and when he rises the worn cloth of his trousers catches on the coils. We hear rending fabric as he jerks free. He runs in a different direction from the other two -- not their companion, I think -- and a few yards away he stops and turns to peek through the scrub at us, as though aware the dog is not fierce and we aren't in pursuit. Our search has disturbed a small tent city, and as we work our way through the reclaimed box springs and three-legged coffee tables and mouse-eaten recliners that have become a sort of home for its inhabitants, the third man watches our progress from the edge of the brush. This is a well-lived space, but there is nothing of the missing girl here. Charged on this search to find any human scent in the area, living or dead, Hunter has done what he is supposed to do. But he watches our response. From where I stand, it is clear Hunter knows what we've found is not what we seek, and that what we seek isn't here. He gazes at Max, reading him, his eyebrows working, stands poised for the "Find more" command. "Sector clear," I say into the radio after a signal from Max. I mention the tent city and its inhabitants and learn it is not a surprise. "Good boy," says Max. Hunter's stance relaxes. As we move away, the third man gains confidence. He steps a little forward, watching Hunter go. He is barefoot and shirtless. "Dog, dog, dog," he says voicelessly, as though he shapes the word but cannot make the sound of it. "Dog," he rasps again, and smiles wide, and claps his hands. Saturday night in a strange town five hundred miles from home. I am sitting in a bar clearly tacked on to our motel as an afterthought. The clientele here are jammed against one another in the gloom, all elbows and ball caps bent down to their drinks -- more tired than social. At the nearby pool table, a man makes his shot, trash talks his opponent, and turns to order another beer without having to take more than four steps to get it. This looks like standard procedure. The empty bottles stack up on a nearby shelf that droops from screws half pulled out of the wall. Two men dominate the table while others watch. The shots get a little wild, the trash talk sloppier. A half-hour ago, when I walked in with a handful of teammates, every head in the bar briefly turned to regard us, then turned away in perfect synchronization, their eyes meeting and their heads bobbing a nod. We are strangers and out of uniform, but they know who we are and why we are here, and besides, they've seen a lot of strangers lately. Now, at the end of the second week of search for a missing local girl, they leave us alone. We find a table, plop down without discussion, and a waitress comes out to take our orders. She calls several of us "honey" and presses a hand to the shoulder of one of us as she turns away. Either the town hasn't passed a smoking ordinance, or here at the city limits this place has conveniently ignored the law. We sit beneath a stratus layer of cigarette smoke that curls above us like an atmosphere of drowsy snakes, tinged blue and red and green by the neon signs over the bar. Beside the door, I see a flyer for the missing girl. Her face hovers beneath the smoke. She appears uneasy even in this photograph taken years ago, her smile tentative and her blond, feathered bangs sprayed close as a helmet, her dark eyes tight at the edges, like this picture was something to be survived. I have looked at her face all day. On telephone poles, in the hands of local volunteers, over the shoulder of a big-city newscaster at noon, six, and ten o'clock. She is the ongoing local headline. She's the girl no one really knew before her disappearance, and now she's the girl eager eyewitnesses claim to have known all their lives. It's hard to tell what's real and what isn't, but for the most part that's not our job. We go where law enforcement directs us. We run behind search dogs who will tell us their own truths in any given area: never here, was here, hers, not hers, blood, hair, bone, here, here, here. We humans aren't talking about the search, our first day at work in this town. Inappropriate discussion in a public place, and we are exhausted with it anyway. Though today's bystanders seemed to think we could take our dogs to Main Street and race them outward across all points of the compass -- first dog to the victim wins -- canine search-and-rescue doesn't work that way. Assigned to locations chosen by law enforcement, we work methodically, dividing a region into sectors to be searched by individual dog-and-handler teams. It's a meticulous process, but trained dogs can quickly clear a large area it would take humans days to definitively search. Even so, we could be here for weeks. We already feel the trackless absence of this girl. Her hometown is small, but its outlying population is widespread, and there are places to hide a living woman or the remains of a dead one that cross lines into other states. Today we were sent to clear more "hot spots" -- places where bodies have been dumped before. Shrouded, ugly areas they were too, scarred from previous events, but not this girl, this time. All day the dogs have been telling us: Not here. Not here. Not here. I look at her photograph again. A big guy shifting on his stool blocks the ambient light from the bar, causing the girl's face to purple beneath the neon and the whites of her eyes to swallow the irises. Her gaze no longer connects. It's a condition that was true of her in life, some say. She has a history of scuttling head down, of sitting at the back of the class, never speaking unless spoken to, and even then as briefly as possible. She sounds uncertain on her voicemail greeting, enunciating her name with a rising inflection that suggests she isn't quite sure of it. We hear fragments. The cumulative description adds up to a girl who began inching away from this town six years earlier, who saved her allowance and bought a junky car simply to have her first job at a truck stop in another town fifteen miles up the road, who saved her paychecks to buy a used laptop, and who had begun recreating herself in variations all across the Web. No judgment, says a neighbor. An accident waiting to happen, says one interviewee. Authorities suggest she might be a runaway if it weren't for the methodical, calculated nature of her young choices. She might be a runaway if it weren't for her purse, cell phone, keys, car, and laptop left behind at her grandmother's house, the last place she was seen alive. We're told she has a tattoo, inked by a trucker where she worked: a butterfly with the letter K on her left wrist. The tattoo is in honor of an online friend, Katie, who had slashed her own wrists in a successful suicide -- or so it was rumored, until Katie returned to a chat room a month later with a new location, new name, new boyfriend, holding up her woundless wrists for photographs, laughing at the duped online friends who thought they knew her, who had responded to her loss with depression, Paxil, and new tattoos in her honor. April Fools, all. Did our girl admire her, forgive her? I wonder. Is this a copycat drama? I turn away from her photograph. She's not my daughter, but I feel a mother's impulse to push the bangs from her eyes, the rescuer's urge to put two fingertips to her carotid to check for a pulse. We're a quiet group, tight and preoccupied. Still wired from the day's search, we lean forward over our food, weight on the balls of our feet with our heels lifted, as though we'll push up at any moment to go back to work. Unlikely. We're stood down for the night and have an early call in the morning. It always takes a while to let go enough to sleep, especially as a search presses forward over days and investigators' verbs begin to change from she is to she was. That little shift in tense is enough to keep us awake all night, revisiting the day's barns, ravines, burned houses, tent cities, and trailer parks, triple-checking ourselves against the signals from the dogs. To say this girl haunts us is to overdramatize. But we all mull choices made in the field long after we should be sleeping. I stab at my coleslaw and wonder when one of us will finally relax into the back of a chair. In time, Terry, a canine handler, leans over to say to me, "Hey. I hear you're going to work a dog." The others look up. "Yes,"' I say. The word feels huge as a wedding vow. I've been on the search-and-rescue (SAR) team for a while now, running beside certified dogs and their handlers, working as a field assistant responsible for navigation, radio communication, medical assessment, and other pragmatics of a working canine search team. After three years, I'm senior enough to have earned the next open slot to train and run beside a search dog. I am excited about this, but a little nervous too. Having run with more than a dozen breeds and their handlers, having searched night into day for the living, and having knelt over the dead, I'm aware how serious a proposition bringing a new dog to the team is. Working search is not a hobby or a Sunday pastime. ''What breed you thinking of running?" he asks. He handles a Border Collie, a high-drive, obsessive-compulsive boy who is good all around, but particularly good searching on water. "I'm not sure. Maybe a Border Collie. Maybe an Aussie. Or maybe a Gol . . ."
"You give any thought to a Golden Retriever?" I nod, and he tells me about his former Golden, Casey, a good dog with a lot of smarts and a lot of soul and a nose that never stopped. A good dog that died, too soon, of cancer. Though my colleague is not one who generally talks at length, his description is detailed. I see the shape of his Golden boy emerge. A sturdy fellow with a nice face and a wide grin -- funny, perceptive, and compassionate. My teammate speaks, and his voice constricts. This dog has been dead for more than five years. Terry's love for the animal had been too raw at the time he began training his own search canine, and he couldn't go with a Golden. Listening to him now, I'm aware it's an open wound. Toughened by years as a homicide detective, he is still not in shape to have another Golden, he says, but he's safe enough recommending one to me. And the breed has much to recommend it for search work: drive, stability, commitment to working with a human, congeniality, and nose. I already have other dogs and cats, and for reasons of amicability at home, as well, I'm also drawn to the idea of a Golden. We speak of other search-and-rescue Golden Retrievers: iconic, much-photographed Riley traveling aloft in the Stokes basket across the debris of the World Trade Center and diligent Aspen supporting her exhausted handler as he presses his face to her back following a search of the collapsed Murrah Federal Building in Oklahoma City. This fine breed figures in virtually every aspect of search. Snow dogs, bomb dogs, drug dogs, arson dogs too. "Got to love a retriever," says Johnny, a Lab man himself, and then he chuckles. "But, girl, no matter what kind of puppy, there's gonna be some housebreaking and chewed shoes in your future." "And sleepless nights," says Ellen. "And poop," adds Terry wryly, a cautionary finger up. "These high-drive dogs. All that adrenaline. When a puppy starts working, you just wouldn't believe the poo . . ."
I push away my coleslaw. Leaning back in their chairs at last, the whole group seems pleased about my coming duress. They exchange young SAR dog stories, not one of them featuring angelic puppies poised for greatness. There's disaster in every punch line -- "the neighbor's TV made him howl" . . . "ate right through the drywall" . . . and "then her parrot learned to bark." I look at the team trainer dubiously. "This is good," says Fleta, rubbing her forehead. " A new pup-in-training always gives the whole team a boost." Her eyes are tired, but she grins as she lifts her glass in salute. On any given day in America, there are as many as one hundred thousand active missing persons cases. A large percentage of these cases go unresolved. At the same time, the recovered and unidentified remains of some forty thousand people are held by medical examiners across the country. As a search-and-rescue worker in the field, I am caught by those numbers -- they equal the population of a small city. I'm aware that we run dogs in the thin air between possibility of life and probability of death, and that while we search for a single girl whose weathered flyers have already begun to fade, there are thousands of others actively being searched. Or not. Knowing how many people are involved on the search for this young woman, I cannot imagine the number of investigators, grid walkers, pilots, ATVs, equestrian units, dog teams, and forensic experts of every kind needed to resolve all the others. I suspect geography, marginalization, and limited resources mean quite a few of the missing are short-term questions that go unanswered -- or are never raised at all. Our small-town girl disappeared in a slow news period. I wonder how much time she's got before funds run out, new local troubles arise, and she is crowded from the docket to take her place in local lore. The margin between SEARCH CONTINUES FOR MISSING TEEN and UNIDENTIFIED REMAINS UNCOVERED IN STATE PARK ten years from now seems narrow. Time and numbers make me urgent. I cannot train my new dog too soon. The above is an excerpt from the book Scent of the Missing: Love & Partnership with a Search-and-Rescue Dog by Susannah Charleson. The above excerpt is a digitally scanned reproduction of text from print. Although this excerpt has been proofread, occasional errors may appear due to the scanning process. Please refer to the finished book for accuracy. I'm not usually into dog stories, like Marley and Me-they feel a little too sappy. But I have always thought search and rescue dogs were fascinating, and I'm going to pick this one up-thanks for the review! Wow, this sounds amazing (I'm a total dog person!). Heather - I also thought Marley and Me was kind of sappy but I enjoyed this one a lot. Steph - definitely check it out!